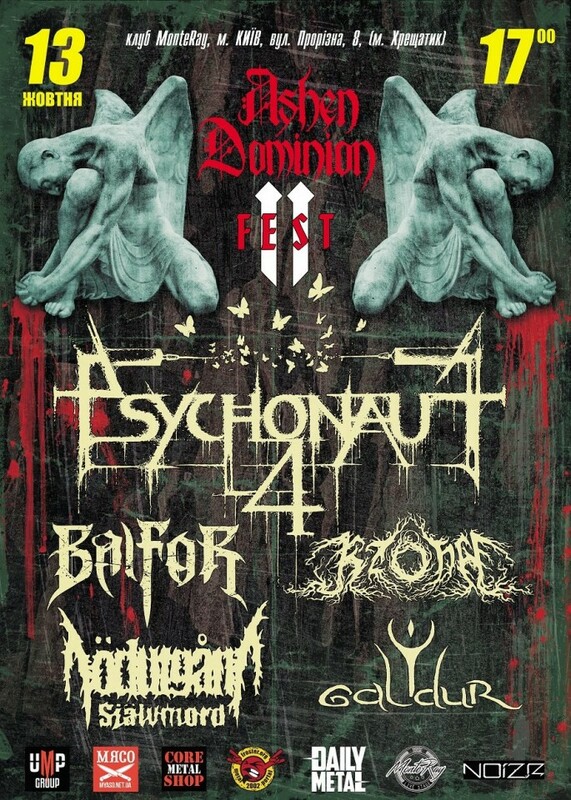 The second festival of the label Ashen Dominion will be held on October 13 in Kyiv, Ukraine. Among the performing acts of the event are Georgian and Ukrainian bands — Psychonaut 4, Balfor, Kzohh, Nödutgång:Självmord, and Galdur. The debut festival of the eponymous Kharkiv-based label Ashen Dominion took place on March 31, 2018 in Kyiv, featuring 5 Ukrainian black metal bands Khors, Raventale, Ulvegr, Kzohh, and Severoth. Follow the link to chack out the photo report from the event by Mila Immortality. PSYCHONAUT 4. Depressive guys from Georgia are coming back to the Ukrainian capital. Listeners are welcome to the fest of self-destruction, pain and despair. Well-known and expected tracks from "Have a Nice Trip" and "Dipsomania" albums, as well as new tunes from relatively recent "Neurasthenia" release, will ensure the proper mood. BALFOR. One of the oldest Ukrainian black metal formations is to hit the stage again. Guys will make you happy with their best pieces from Barbaric Blood and Black Serpent Rising albums. KZOHH. Ambassadors of death, suffering and unrecoverable loss are returning to our fest stage. This time with basically new set dedicated to chemical and radiological experiments against humanity. NODUTGANG:SJALVMORD. Craftsmen of depressive atmosphere mixed with post rock from Poltava (UA) are going to introduce you their best pieces in terms of our fest. The band is known for their full-length and EP, tracks from which have been recognized and much admired. GALDUR. Severoth’s atmospheric ambient / dungeon synth project. Listeners are to immerse into fairytale atmosphere of ancient visions, great battles and forgotten legends.